Many of our own young people go off to university and we pray that they will find a home in a good local church which will care for them and encourage them in their faith during their time away from home. So, if you are a student here in Lincoln, we would love to do the same for you! Being a student is all about spreading your wings, but it is also about putting down roots which will last you a lifetime, roots that will enable you to grow and be fruitful. So get yourself rooted! We can help you do that. 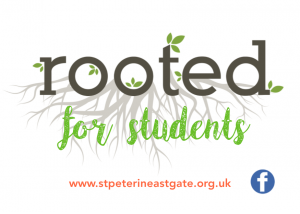 “Rooted for Students” happens after our 6pm Sunday evening service. Come along for a home cooked Student Supper followed by discussion and prayer around the Bible passage for the day. Further details from James Radcliffe. There is always plenty going so lots of things to get involved with to help you grow as a Christian during your time in Lincoln. Do join us any Sunday at 10.30am or 6pm and introduce yourself. We’d love to meet you!